The growing use of smartphones over the last few years is visible. And companies of all types have focused their attention on sales strategies that take advantage of this movement: it’s the so-called mobile marketing. It’s not only about targeting marketing actions to the web. More than this, the idea is to target them specifically to mobile users. It’s not hard to find numbers that prove the importance of thinking mobile and justifying why you need to invest in mobile ads. According to Statistica, the number of smartphone users is projected to grow to approximately 2.5 billion in 2019 worldwide. Therefore, this is obviously a global trend, and we need to be aware of this fact when it’s time to consider a sales strategy for our business. 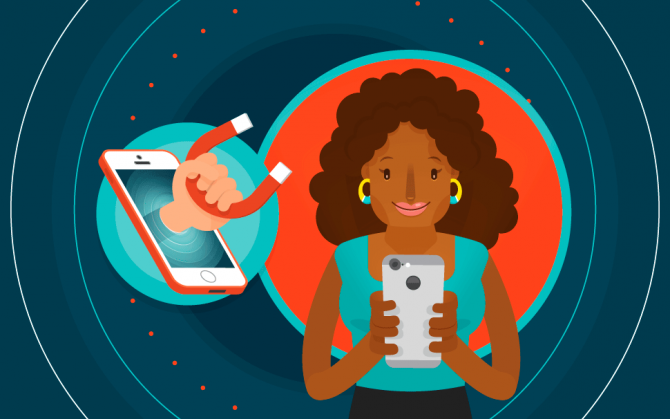 In this post, we’ll tell you everything you need to know about mobile marketing and give you several tips to help your brand reach your audience’s cellphones. As you have probably noticed, mobile marketing is the digital marketing strategy for smartphones, tablets and other mobile device users. They are promotions of your brand made on social media, emails, SMS messages, apps and much more. Each media has its own particularities that we need to be aware of when we want to showcase our brands. And these details require attention for better interaction with the target audience. Therefore, mobile marketing is the set of strategies meant to target specific users of mobile devices, taking advantage of each media characteristic and its features. As we said earlier, lots of people are using smartphones to access the internet, in fact, a considerable amount of those people actually prefer to access the intertnet on their phones rather than on computers. But what entrepreneurs have to keep in mind is what do these users do on the internet while they browse their mobile devices? This question isn’t hard to answer: they’re looking for convenience! Convenient information, convenience in their interactions with friends, in searching for knowledge and the practicality of performing basic tasks during their day. Therefore, your company shouldn’t only appear on these networks. It must have accessibility so that users can know and understand how your enterprise can be useful to them. It’s important to know that people are increasingly buying and hiring services while they browse the web. And that’s why you should know everything about mobile marketing, such as developing a solid strategy for your company. There used to be a time when talking to people took a long time. As well as the time when we had no option but to go out and buy something is long gone. Now everything is done by on smartphones. With the convenience of having access to everything at the palm of your hand, it’s more than essential that your business is seen on the internet. Mobile marketing thinks about how your company can convey reliability and credibility to users. From having a responsive website design to ranking your content on Google. Everything must be taken into account so that people will click on your ad, browse without major problems on your website, purchase what you are offering and remember your brand whenever they need something. What can you do to have a good mobile marketing strategy? You might have noticed the importance of considering the mobile context when it comes to promoting your business, right? You’ve already seen this term in this post, right? Now, we’ll explain what having a responsive website means, in addition to showing you its importance. Users have a significant variety of options to browse on the internet nowadays. They can access the web on a desktop computer, laptop, tablet, cellphone and even on their TVs. A responsive website must adapt to each of these options! It is still very common for websites to be designed only for traditional desktop computers. So, when they are accessed from a mobile device, which has completely different size standards, the elements become distorted, the content is hard to find, and texts are disproportionate… An utter mess! So that you don’t have this problem, your website must meet the demand of mobile users. And this doesn’t mean that you need to create several versions with different addresses. Nowadays, a website can recognize the device from which users are accessing and adapt to it. And this is what we call responsive. It’s important to think about each detail of your website’s design, about its different versions. Everything must be planned in detail so that the user experience is the best as possible and ensures that they can share your content and even purchase your product or service. You are probably thinking that using SMS is quite outdated when compared to the technological innovations and instant messaging apps. But the good old text message is still very useful and can be a good tool for your company. SMS is still a relatively cheap resource if we consider its advantages. With it, you can advertise promotions and new products, offer a channel for relationships, get feedback from your customers, bring your company closer to your target audience and strengthen their engagement with your brand. All in a very simple and objective way. In addition to being cheap, it’s an easy-to-use tool. Because of all this accessibility, you need to take certain precautions and know how to do SMS marketing. These precautions should be taken to avoid inconveniencing people. For example, no one wants to be woken up at 3:20 a.m. with a promotional SMS message. Another precaution is with SPAMMING, which doesn’t appeal to anyone and we’re sure that includes you. Avoid sending unnecessary content without permission or to an excessive number of people. To do so, you should create a good customer database. Logically, this information has to be provided by them, and you should have an objective strategy before sending the messages. For those who still don’t know what a QR code is, it’s a 2D graphic that provides information ranging from phone numbers, SMS, texts and even links to website addresses. All contained in the design formed by little black and white squares inside one another. Well, but why should you use it? Because it’s a great media convergence tool. The most modern cellphones have cameras that can scan them and allow users to access certain content with their smartphones. Therefore, you can use a QR code for numerous functions, from getting users to access your website easily through their cellphone by means of a printed ad, and even to provide tickets, messages and much more. So far, we have mentioned countless advantages of mobile marketing for your company. And perhaps this strategy’s most important tip is the creation of your own app. Having your own app not only establishes your presence in the digital world, as well as offers even more convenience for your users. Another benefit of an app is building customer loyalty. They will have your company at their fingertips and will certainly remember you whenever they need something. Apps facilitate the dissemination of your content, promotions and new products. This type of strategy is one of the most efficient ones when we think about conversion rates. In order to have a campaign that brings good results, you need to have a well-consolidated customer database. From it, you can define the best strategy in a personalized manner. You should define your campaign pieces according to each user’s age, gender, location and search preferences. And all the metrics to target a campaign can be easily found on social media or on your website’s platform. By knowing how to analyze this data, you can optimize your actions and focus on certain strategies for a certain audience. Or still, broaden your activities in search of a new target audience. So, be sure to invest in a well-targeted campaign. Even in the case of a local business, with a physical store and a given customer turnover, you can benefit a lot from mobile marketing. All you need to do is create digital files and share them with your consumers via Bluetooth. You can share your shopping list, product suggestions and promotion ads with your customers, who will carry a marketing piece with your brand on their smartphones. This sharing technology is considered to be outdated, but it is still present in most modern smartphones. Therefore, it can still be a good tool for your business and building customer loyalty. Obviously, this resource is only possible for physical stores. If you don’t know what gamification is, we’ll sum it up for you: games are increasingly present in people’s everyday life. Therefore, they have also become a tool, especially to grab young people’s attention to learn something. Many companies invest in the gamification of their content in order to exploit a market that has been on the rise for quite a while and has a very loyal audience. Those professionals, who seek to work with education in the digital world, find in games, a great way of attracting an audience and holding students’ attention. If you are an online teacher, be sure to think about how to use gamification in your project. By creating a game with the material you wish to teach users, you won’t only get their attention, but you’ll also be able to create greater interest and engagement, will pique their interest and also break the taboo that studying is boring. With all these tips, you have probably noticed the importance of investing in mobile marketing for your business. And don’t think that the advantages end here. You can also explore your virtual strategy even further, especially if you invest in the production of educational content. In order to learn more about the subject, make sure you check out our post about mobile learning and learn how to use this strategy to stand out even more in the market.